Whatever Happened to the Energy Crisis? The term energy crisis was apparently first used in the later 1960s, by whom I am not sure. Presumably it means a situation where the available energy supplies are so low as to prevent or even reverse economic growth. The underlying idea is that energy is mostly derived from fossil fuels which will be exhausted within relatively few years. Although since the 1960s there have been one or two episodes that are occasionally interpreted as energy crises, it is by now clear that whatever it is that ails the world economy, it is not a shortage of fossil fuels. In fact, popular discussions have recently turned from the oil "shortage" to the oil "glut. "In retrospect, it appears that predictions of an energy crisis were just another example of a resource scare, of which there have been many in the past. As long ago as 1865, the great English economist William Stanley Jevons worried about the consequences of Britain running out of coal. As it happens, Britain is still producing large amounts of coal and has also gone into oil and gas in a big way. I think it is appropriate that we should end this conference on energy economics with a look at the record of the past nine years, the years since the energy world was turned upside down by the 1973 Arab oil embargo.This nation's foremost energy accomplishment of this period has not been in achieving increased production. Despite a tenfold increase in the price of crude oil, U.S. production in 1981 was about the same as in 1973. Natural gas production was down. Production of coal and uranium has gone up some, but overall, neither consumption nor domestic production of energy has increased in the last nine years. On March 28, 1979, an event at the Three Mile Island (TMI) nuclear plant of the General Public Utilities Corporation placed the future of nuclear power in the United States in doubt. The "transient" that led to the partial melting of the cladding around the fuel rods was to create concern in the nuclear industry and in the public at large about the safety, costs, and acceptability of nuclear power. While the impressionistic evidence is that TMI has caused great problems for the industry, there is little systematic evidence that this is the case. What real damage did the accident do to the prospects for nuclear power in the United States?The potential damages to the nuclear industry were of several varieties. First the accident might have caused people to reevaluate the safety of nuclear reactors. The world oil market is a forecaster's nightmare: seldom have so many knowledgeable observers been so wrong so often. Prior to 1973, few foresaw the magnitude of the price jump that was possible under disrupted conditions, or predicted the years of relative stability that followed. The Iranian revolution brought a similar surprise. On the other hand, in the fall of 1980 came the Iran-Iraq war; again a major price shock seemed at hand. Experts are still arguing about why it did not occur. The spiraling costs of energy within the last decade have stimulated renewed interest in the increased efficiency of energy production and consumption.' 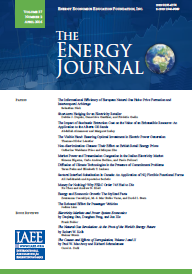 Electricity is a relatively mature sector where considerable theoretical work on the economic aspects has been carried out since the 1950s.2 While the microeconomic principles underlying optimal investment planning and pricing policy have received much attention in the recent literature, less effort has been devoted to the effects of quality of supplyand output reliability. Electric utility system planners must design system capacity ex-pansion paths that satisfy generation requirements at least cost. Historically, doing this required information regarding the system load duration curve and alternative fuel and capital costs. By putting fuel and capital costs into a linear program, system designers could then calculate the amount of electricity that base, intermediate, and peaking plants should generate and how much capacity each plant type should have. Designing appropriate programs to deal with present and future energy problems faced by the United States has created a need for the evaluation and comparison of different policies. An important component of this is the generation of accurate information concerning the benefits and costs of alternative courses of action. Energy analysis is enormously complex, however, due to the pervasive influence of energy throughout the economy and the manifold factors that must be considered. Schmalensee has written that "discussions of energy policy, especially as regards new technologies, tend rapidly to become unwieldy because of the large number of serious complicating factors whose relevance is arguable" (1980, pp. 2-3). As a result of these complications, any information available to evaluate alternative energy policies Will almost of necessity be incomplete. The demand for energy is a derived demand, since it is transmitted from demands for goods and services that incorporate energy as an input. Trends in the ratio of energy consumption to the level of output the so-called energy coefficient-are often used to examine energy demand in the industrial and other demand sectors.' In a market economy, the inference of this approach is that at a time of increasing energy prices, a rise in the energy coefficient is an indication of waste and inefficiency or of a perverse price response. Correspondingly, a fall in the energy coefficient is evidence of the efficacy of the price mechanism and government regulations inpromoting energy conservation. Hawaii is extremely vulnerable to disruptions in the world oil market. Over 90 percent of the state's energy comes from imported petroleum, most of which comes from foreign sources. Petroleum also has an indirect impact because of the large role tourism plays in the Hawaiian economy. There have been several comprehensive studies of energy policy in the last few years, for example, Shurr (1979), Federal Energy Administration (1976), ERDA (1976), and the Ford Foundation (Landsberg, 1978). Unlike these studies of energy policies, this effort is not prescriptive. Rather, it measures the effects of a large set of policies on energy markets to provide an understanding of how government programs reinforce or offset one another.